Nails Inc Nail Polish (Rainbow Wishes) ~ $16.00. Polishes have been formulated with a long-wear system and feature the NAILS INC. wide brush for flawless application. How have I not tried a full size Nails Inc polish before now?! I have tried their mini sizes, but there is something amazing about the full size and it is the BRUSH! It is hands down amazing! I can tend to be a little messy while painting my nails; but, this brush actually makes painting nails the easiest. It is thick and wide with a slight curved bottom and boom - no mess. Plus, this shade Rainbow Wishes is stunning! If you would like to see my swatches and the brush, I did share them on a past post here! Essie Gel Couture Polish (Sage You Love Me) ~ $10.95. Essie Gel Couture is a gel-like manicure system that does not require a UV lamp or a base coat. Gel Couture shades last longer than regular polish (up to 14 days). The easy two-step process involves first, apply two coats of Gel Couture Color (allow manicure to dry for 60 seconds between coats), and then apply one coat of Gel Couture Topcoat. Again, talk about an absolutely amazing brush and formula! The brush is very to everything I love about the Nails Inc brush. I didn't need any clean up and the polish was beautifully opaque in 2 coats! I did 2 posts on this polish - my initial thoughts, and an update after 1 week. It was still great after 1 week and if I were to have written a post after 2 weeks it would be almost as good - there was hardly any chips or wear. If you want long-lasting polish, you need this formula in your life! Stila Glitter & Glow Liquid Eye Shadow ~ $31.00 each full size (deluxe sizes pictured). A brilliant and long-wearing, liquid glitter eyeshadow. I have 3 shades - Kitten Karma, Diamond Dust and Smoky Storm and had to include them all here because they are all stunning! The formula is so easy to work with and they look amazing on the eyes - instantly boosts any look and are really great for any skill level. They are a little pricey; but, if you can find them in a value set - grab them! I know I will be picking up more of these full size! I did a full post with swatches and makeup looks with the 3 shades I have - if you are interested, you can check it out here! Tarte Amazonian Clay 12-Hour Blush ~ $38.00 for full size (deluxe sizes shown here). A long-wearing, solar-baked blush that lasts up to 12 hours. This is another item that I'm wondering how I have not tried yet?! I love Tarte so I'm surprised I haven't tried their blushes yet! The formula is amazing and the pigmentation is exactly what I'm looking for - well pigmented that it shows up; but, can still be built up if that is the look you want and not too pigmented where it looks like too much right off the bat! I have Paaarty and Ornate and both are stunning! The best part is, Tarte's value sets always have a little blush, so if you haven't tried them yet, that is a great way to check it out! This mascara is definitely a late addition to this list; but, I couldn't leave it off! I did have it for a couple of months before I actually decided to give it a shot! This is basically everything I am looking for in a mascara - it isn't a super wet formula, has a really full wand, and gave me tons of volume! If you want to see how it wears on me - you can see my review and swatch post here! It's been a couple of years since I found a new mascara that I love - plus it's drugstore! I have always used primers without really having a favorite primer to reach for - that was until I used this primer from Estee Lauder earlier this year! I did think this smoothed my pores and helped blur any imperfections under my makeup. My makeup applied easily to the primer and lasted for the whole day. I have continued to reach for this all year over every other primer! I did review this, if you are interested in seeing my thoughts! Morphe x Jaclyn Hill "The Jaclyn Hill Palette" ~ $38.00 US. This is not your average eye palette. That’d be boring. We (and most importantly, Jaclyn Hill) don’t do boring. This palette is a 2-year love affair. 35 brand-new, OMG eyeshadows that Jaclyn whipped up, formulated, tested, re-tested, and perfected. They were created to deliver not only the best color payoff but also amazing application. Mattes, shimmers, satins, foils, and glitter: all pressed to perfection...just the way Jaclyn wanted. Her dreamy colors are now your reality. So whether you’re pressed for time or have time to play, this palette is your new bestie. Because a girl (and guy) needs to have options. This palette actually took me a few months to warm up to it! I purchased this on the first release in June and swatched it immediately - you can see that post here. Now, there are a couple of things I didn't love - including that there is no mirror and that I didn't get anything with shade names and with this many shadows it would be nice. I did like it initially; but, actually found it a little overwhelming at first to open it and figure out what shadows to use as there is so many. Now, I love the selection and the shadows are really good - they are super smooth and easy to blend and always make a great makeup look! 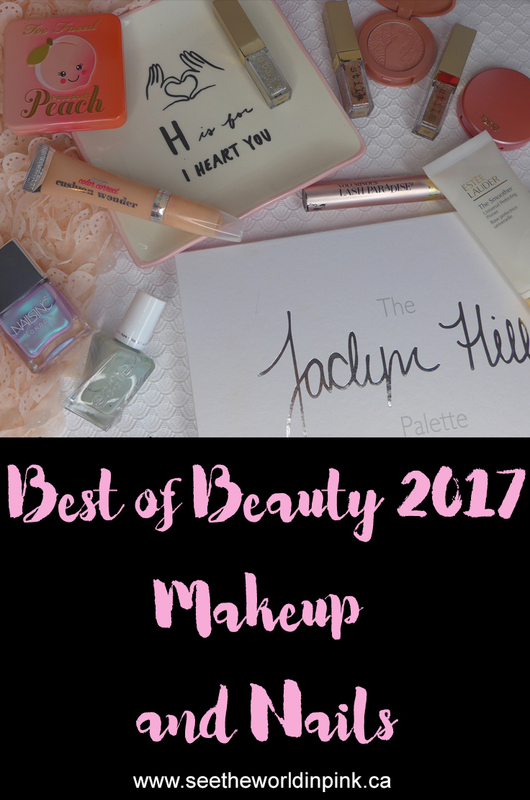 Did you love any of the same products that I did this year?